In this post I will be talking about setting up an SMS Gateway so receive SCOM Notifications as SMS. As we all know that, Operations Manager has four different channels of notifications, SMS is one of them. I have a few clients for whom I have configured an SMS Gateway to receive SMS Notifications in SCOM. There are a few pre-requisites you need before you start with this process. Firstly, you need to have a SMS Gateway. For my clients I have been purchasing modems from http://www.multitech.com. The next thing you will need is a Sim Card to send SMS. You need to contact your local ISP for a Sim card. Once you have these in place you should be good to start configuring the SMS Device. Insert the SIM card into the modem. The Username and Password by default are admin. Enter the credentials and press Login. Once the credentials are loaded the main screen will be displayed. Click on IP SetUp on the Main Screen. Configure the IP you want based on your LAN Settings. It should be noted that the IP must be reachable by the Root Management Server. Configure Auto Dial Properties as shown in the screenshot. Be sure to keep the RAW DIALOUT option to enable but you can change the port. I use the Default Port Number 5000 shown in the above screenshot. 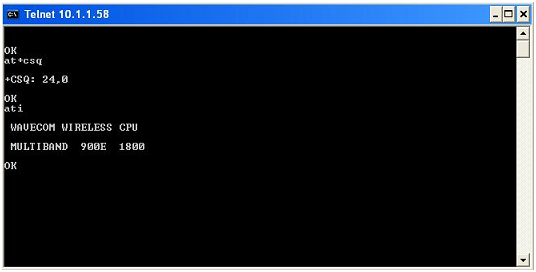 Scroll down the page and enable telnet as shown in the Screenshot. 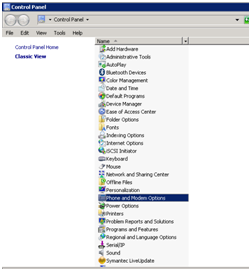 Save the configuration by clicking on Save and Restart and shown in the screenshot. Now Click the PPP Menu as shown in the screenshot. 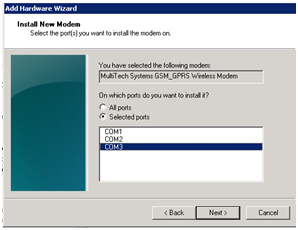 Make sure you have Disabled the PPP option and save the configuration as shown in the screenshot and the Modem Configuration as shown below. Again, Save and Restart the device. Now Log-On to the Root Management Server and Open Command Prompt. To Test the connection, perform a Ping test from the RMS. Once, you get a reply back the connection is OK.
Now, connect to the device by using the command Telnet <ip address> 5000. Send an AT command (Type AT and Press Enter) to see if modem is responding. Please note that it is normal to see the letter you type in double as shown in the screenshot. Now, send the command AT+CSQ to test signal strength. Anything between10-30 is OK. However, if you do not see sufficient strength or 99,99, you need to change the QuadBand Frequency. By default the QuadBand Frequency is 850, 1900 MHz. However, to change the QuadBand Frequency you need to run the AT+WMBS=5,0 command. This will now produce good signal strength between 10 and 30. (The current QuadBand Frequency will be 900, 1800 MHz). 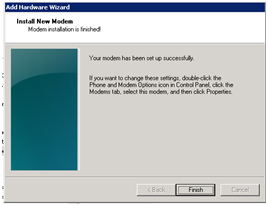 Your Modem Configuration is now complete. If your Root Management Server is virtual, you need to download and install this application. This software lets you create a virtual COM port and acts as if the Modem is directory connected to the RMS through a COM port. However, if your RMS is a physical server you dont have to download the software. You can simply connect the the SMS Device to your RMS through the com port. Install the Serial/IP software from the website. 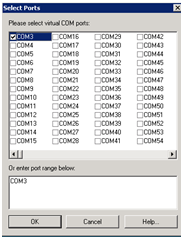 Select a virtual COM port to create as shown below. 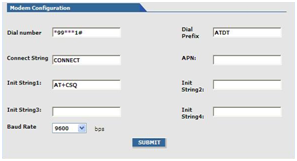 Click on the Configuration Wizard, to configure the IP and the Port of your SMS Device. 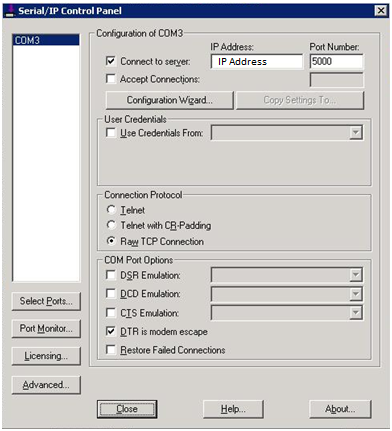 Check the DTR is Modem Escape check box and RAW TCP Connection radio button. Now click on the Advanced Tab. Check the Extend Server Connection by and enter 2000 ms. Also uncheck the box on Include Domain in Windows Credentials. Now, you need to install the drivers for the SMS Device. The drivers for your device can be found at http://www.multitech.com/en_US/SUPPORT/Families/MultiModemGPRS/drivers.aspx . However, if the drivers for your specific device is not listed, you can download the drivers for the class of your model (For example MTCBA) based on your Operating System Architecture. 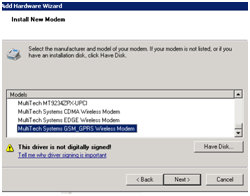 It should be noted that the drivers must be installed on the Root MS.
Download the drivers on your Root MS to install the modem. Open Control Panel and select Phones and Modems. Uncheck Don't Detect my Modem check box. 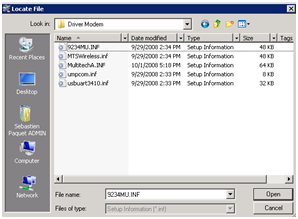 Click have disk and locate where you have extracted the drivers. Select the drivers and click Open. 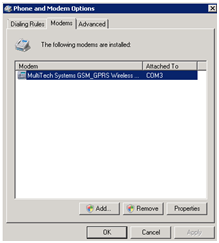 Select the Multitech Systems GSM_GPRS Wireless Modem. Click Next. 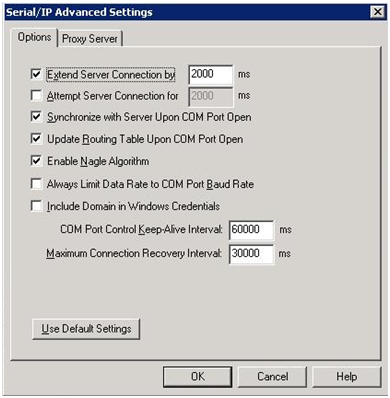 Select the port that you have created in Serial/IP. (COM 3 as per the blog). You should now be able to see modem in Phone and Modem options. Click the Properties Tab. 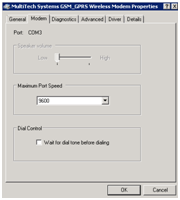 Select the Modem Tab and change the Maximum Port Speed to 9600 and also uncheck the Wait for dial tone before dialing check box. You SMS device drivers are now installed. To receive notifications, In SCOM go to Administration--->New Channel--->SMS Channel---->Finish. You should make sure that when you create a subscriber, the format of the phone number should be +(countrycode)(number).